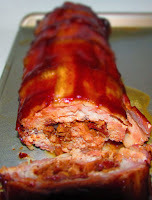 This is one of the recipes MiMi picked to make for her Loveless Cafe inspired menu for family dinner. We all love pork chops, so she knew this would be a hit. 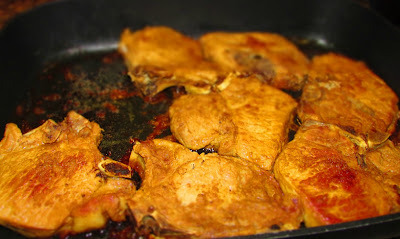 The braising liquid was full of wonderful flavors that really complimented the pork, and of course the low and slow method of braising the chops left them super tender. We each enjoyed our large pork chop and Matt enjoyed two! I don't normally think of braising my chops (unless it is in mushroom soup gravy), but I may have to try some more variations on this! These pork chops definitely made for a hearty, stick to your ribs main dish for our southern comfort food feast! Heat the oil in a large electric skillet over medium-high heat. Sprinkle the chops with salt and pepper and brown both sides in the skillet. Mix the water, mustard, vinegar, brown sugar, Worcestershire and garlic salt. Pour over browned pork chops. Cover and reduce heat to a simmer. Braise for at least one hour. Remove the lid and continue to cook until the sauce has thickened. It's hard planning dinner around everyone's tastes and preferences. Thank you so much for stopping by! 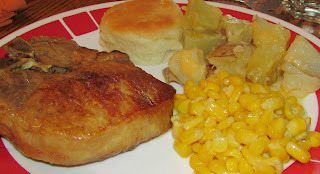 Pork Chops are a family stable dinner at my house!! Thanks for Linking up on My 2 Favorite Things on Thursday!! Hope to see you again tomorrow!! I love having You!! Pinned!! We love pork chops too, they are so versatile! Thanks for stopping by, see you tomorrow!